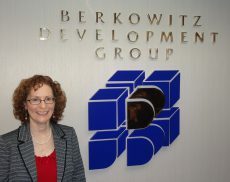 Jeff Berkowitz is the Chairman and Founder of Berkowitz Development Group. A former practicing attorney, he is widely recognized as one of the pre-eminent retail developers in Miami-Dade County. His expertise includes areas relating to all aspect of development, including leasing, management, construction management, customer and tenant relations, budgeting, projections and governmental relations. With his formal legal training and active experience practicing law, he also provides support in negotiation and a wealth of experience in dispute avoidance and, if necessary, resolution. Prior to founding Berkowitz Development Group in 1985, Mr. Berkowitz was an active partner in the law firm of McCrary Berkowitz & Davis from 1974 and later the senior partner of Berkowitz & Diaz until he retired from the active practice of law to pursue Real Estate Development on a full-time basis in 1986. Mr. Berkowitz specialized in a real estate oriented practice. Founder, Children’s Foundation of Greater Miami, Inc.
Mr. Berkowitz holds a B.A. in Political Science from Cornell University. He is also a graduate of the University of Miami School Of Law, where he served on the Law Review and obtained a Juris Doctor degree in May, 1974. Mr. Berkowitz holds an active Real Estate Broker’s License and is a member of the International Council of Shopping Centers. 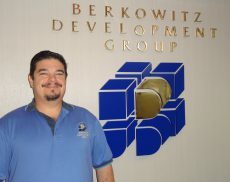 Michael R. Berkowitz is the President of Berkowitz Development Group (BDG). He is responsible for overseeing the comprehensive management of BDG’s portfolio, leasing strategies, new acquisitions, due diligence, marketing, feasibility analysis, and is heavily involved with the construction operations of current and future projects. Over his career, Michael has participated in the acquisition, development, retail refinancing’s, disposition, leasing and management of nearly 1.5 million square feet of office and retail properties. Michael began his real estate career with Berkowitz Development Group in October of 2002. Mr. Berkowitz holds a Bachelor of Science Degree in Finance, with a minor in Real Estate, from the University of Denver. Mr. Berkowitz presently holds an active Real Estate Broker’s License from the State of Florida and is an active member of the International Council of Shopping Centers (ICSC), an executive Board Member for the Miami Children’s Museum, and a member of the University of Miami Citizens Board. Andrew Berkowitz is the Vice President of Berkowitz Development Group. Mr. Berkowitz holds a Bachelor of Science Degree in Business from Skidmore College in Saratoga Springs, NY. He holds a Sales Associate license in Real Estate Sales in the State of Florida and is also an active member of the International Council of Shopping Centers (ICSC). Mr. Berkowitz began his real estate career with Berkowitz Development Group in August of 2008, after operating a Video Voice & Data infrastructure and service providing company of which was later sold to a larger operator. He currently oversees business development opportunities, special projects developed to increase revenues at all shopping centers as well as oversees the specialty leasing objectives. Mr. Berkowitz also manages advertising and marketing initiatives at all of our properties and is involved with the construction and management operations of current, existing and future projects. David M. Singer is Chief Financial Officer and Chief Operating Officer of Berkowitz Development Group (BDG). He is directly responsible for all of the accounting, financial and day-to-day operations of BDG. Mr. Singer joined Berkowitz Development Group in November of 1998, bringing with him over 15 years of prior Real Estate knowledge, which included property management, leasing, financing, accounting and acquisition experience. Mr. Singer holds a Bachelor of Science Degree in Marketing with a minor in Psychology, from Florida State University, and a Certificate in Accounting from the University of Miami. Mr. Singer presently holds an active Certified Public Accounting License, Real Estate Sales License from The State of Florida and is an active member of the International Council of Shopping Centers (ICSC). In February of 2010, Mr. Singer was nominated by the South Florida Business Journal as a finalist for the CFO of the year. He is currently serving on the Florida State University Real Estate School Board of Directors. He also serves on numerous Condo Association Boards. Mr. Singer began his real estate career with Kenneth Leventhal & Company, a national public accounting firm which specialized in the real estate industry. 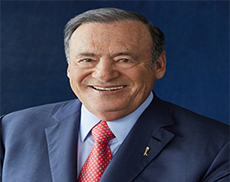 His tenure of five plus years included the engagement of real estate audits, the preparation of tax returns and real estate feasibility studies. After leaving public accounting, he proceeded to work as a Controller and Chief Financial Officer for various national and local real estate developers and management companies including Lincoln Property Company, The Brandon Company and Cushman & Wakefield. Ms. O’Hare shapes and tempers the construction process to defend the interests of Berkowitz Development Group (BDG) as developer in the jumble of contractors, subcontractors, utility companies, tenants, inspectors, architects, engineers, attorneys, and others who both combine and conflict in the endeavor to get a shopping center built. She allows no corner to be cut. Ms. O’Hare is currently working with the design team on the construction drawings for our Gables Station Project. Gables Station is planned to be a +300,000 sf, 8 story vertical retail shopping center with an associated +1,400 space parking garage. Previously, she supervised the construction of Fifth & Alton on Miami Beach. Completed in August 2009, Fifth & Alton is an 180,000 sf 7 story vertical retail shopping center and 1,080 space parking garage located at the gateway to Miami Beach. The center received the Urban Land Institute’s Vision Award for 2010 Project of the Year; McGraw-Hill Construction Regional and National 2010 Best of the Best Awards, and Associated Builders and Contractors Florida East Coast Chapter 2010 Excellence in Construction Eagle Award. She also supervised the construction of The Professional Arts Building, a 90,000 sq. ft., 3 story, office condominium, at the Kendall Village Center completed in 2007; and Kendall Village Center from site work development through the vertical construction (325,000 sq. ft.). The center received the Ernst & Young Real Estate Best Mixed Use Deal of the Year in November 2001. Prior to joining BDG, Ms. O’Hare was a Property Manager at Cushman & Wakefield of Florida; a Property Manager at Lennar Homes Commercial Properties Division; and a Facilities Manager for all of First Nationwide Bank’s Florida facilities (36). All totaled, her years of experience in commercial real estate number 26. Ms. O’Hare also worked at the Congressional Research Service at the Library of Congress, at the US House of Representatives as an assistant to the Hon. William Lehman, and she attended the University of Wisconsin, at Madison Wisconsin. David S. Markowitz is the Property Manager for over one million square feet of retail space in the Berkowitz Development Group portfolio. He is responsible for day to day operations of the shopping centers, which range from maintaining and controlling operating costs for the shopping centers, landscaping, security, janitorial, maintenance, and tenant relations. Prior to joining Berkowitz Development Group as the Property Manager in September 2006, David was a Security Director with IPC International since 1993. 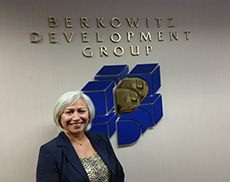 Ana M. Pereira is the Property Manager for over three hundred thousand square feet of retail space in the Berkowitz Development Group portfolio. She is responsible for day to day operations of the shopping centers, which range from maintaining and controlling operating costs for the shopping centers, landscaping, security, janitorial, maintenance, and tenant relations. Prior to joining Berkowitz Development Group as the Property Manager in November of 2014, Ana was a Property Manager with Berger Commercial Realty and Flagler Real Estate Services since 1995. Ms. Pereira presently holds an active Real Estate License from the State of Florida.